“Independent third-party certification and encapsulation.” It’s quite a mouthful to say, and it’s every bit as important as it sounds. Simply stated, “slabbing” has revolutionized the rare coin market, fundamentally changing the way people buy and sell coins. Since its introduction in 1986 by the Professional Coin Grading Service (PCGS), slabbing–the encapsulation of coins in sonically sealed, hard plastic holders with tamper-evident holograms–has greatly diminished the grading controversy that plagued the market prior to that time. It also has eased the crisis of confidence that up to then was spreading insidiously through the marketplace. Today, there is widespread acceptance of the grades assigned to rare coins by PCGS and the Numismatic Guaranty Corporation of America (NGC). But while the Slab Revolution has been a tremendous blessing, it also has given rise to a number of misconceptions–some of them downright myths–among the coin- buying public. Some of these have even been perpetrated, or perpetuated, by members of the numismatic press–the very journalists whose knowledge, integrity and independence serve as security blankets for their readers. Some of these misconceptions are fairly obvious; others are much more subtle. But either way, a myth is as good as a mile. MYTH NO. 1: You can’t get ripped off when you buy a certified coin. This is absolutely not the case: You can get a terrible deal on any kind of coin if you choose the wrong dealer. Certified coins offer important safeguards. First and foremost, they carry grades assigned to them by impartial experts–informed, independent assessments regarding their level of preservation–and these provide protection against overgrading by unscrupulous sellers. It’s up to the consumer to correlate this grade with a reliable price guide stating how much each coin is worth in the designated level of preservation. In one recent case some years back, a coin dealership grossly overcharged customers for coins which had been certified by major grading services. The grading itself was fine, and many of the coins were extremely rare and highly desirable. The problem: The dealer priced the coins at multiples of their fair market value. Just because a coin is accurately graded, that doesn’t mean it’s fairly priced. Overpricing also occurred in connection with esoteric coins which have been certified–unusual pattern coins, for example. Often, these coins fall into gray areas and people have difficulty determining their value. You might have a coin of which only three examples have been independently certified–but that doesn’t necessarily mean that it’s worth a great deal of money. You need to do your homework–your research–in order to establish the fair market value of any coins you’re interested in buying. Just because a coin has been independently certified doesn’t mean it’s a good value.The first step in protecting yourself as a consumer is to get the coin properly certified, and the second step is to pay a fair price at the correct time in the market cycle. MYTH NO. 2: All slabbed Mint State-65 coins are created equal. Coin grading is performed on a spectrum–on a continuum. 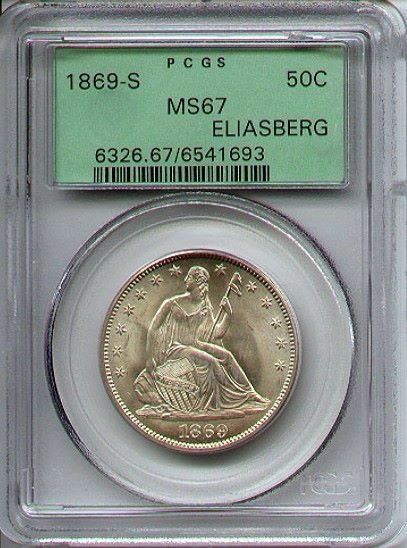 Some coins are high-end for a given grade, some are low-end. Some coins graded 65 are magnificent–beaming with luster and shimmering in their allure, to the point where they might be just a hair away from meriting a grade of 66. Others are dingy, lackluster, spotted or lightly fingerprinted, and barely qualify as 65s. Still others are somewhere in between. “A.” If we believed it was a low-end coin, we would use the letter “C.” And if we believed it was in between, we’d use no letter at all or the letter “B.” To add to the confusion (or at least to the complexity), there are A-plus and A-minus coins, C-plus and C-minus coins and so forth. My discussions and explanations in public forums of this coin grading spectrum were relentless over many years. Despite David Hall, founder of PCGS, publicly disagreeing with my explanation, in 2010, he did an about-face and asked me to introduce PCGS’s new system of recognizing that coins are graded on a spectrum. PCGS introduced “plus” grading, and I cheerfully accepted the post of its paid spokesman in the rollout. NGC caught up quickly and joined the “plus” revolution, recognizing with PCGS that not all coins of the same grade are equal–at least not all coins bearing higher grades. So whether the coin is graded with or without a plus, you should take a close look at any coin you’re thinking of buying, even if it’s housed in a slab. If it looks attractive to you, it might very well be attractive to someone else, as well. But if it looks ugly to you–if it looks as if you had taped it to the bottom of your shoe and tap-danced on it–then pass on the coin and tap-dance to the next deal. a higher grade the second, third, fourth or 50th time around. and census reports do not correct for this irregularity. the standards have not remained fixed. and make better investments than unslabbed coins. misrepresenting the way the marketplace works. and thus can determine the value quite readily. when you sell that coin. which was causing the coins to deteriorate. it. There are many similar examples, but this should suffice. market conditions than the Greysheet. from Wall Street, and the money is here to stay. don’t represent a major outlay. the money left the coin market as quickly as it had arrived. misinformed or an outright liar. at least as much as the fee you pay to get them certified. inexpensive coins–common-date silver dollars and modern U.S.
less than what it cost to get them certified. key concern in their design. sometimes see dealers trying in vain to remove such coins. There you have them: 10 basic myths about slabbing. searchlight, slabbing still looks very good indeed.